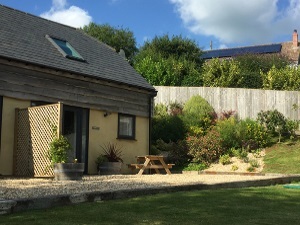 Greenwood Cottage01297 441222work Self-cateringLyme Holiday Cottages offer stylish comfortable self-catering for couples, ideally placed close to Lyme Regis on Dorset's stunning Jurassic Coast. A real home from home, these one-bedroom barn conversion cottages have been carefully designed to provide a high degree of comfort and is fully equipped including high speed wi-fi and a 40” smart TV. It is an excellent base for discovering this beautiful stretch of West Dorset coastline, as well as the county's many attractions. The cottages sit in Morcombelake which has a village shop, art gallery, a tea room and farm shop with cafe. The bustling market town of Bridport is within easy reach with its popular weekly markets on a Saturday and Wednesday. The very place where the TV drama Broadchurch is filmed, Bridport's fantastic markets are a great place for stocking up on local produce. With fabulous coastal and countryside walks on the doorstep, beautiful beaches close by, plenty of pubs and restaurants to enjoy a meal out, and an abundance of attractions for day trips out, Lyme Barn is a superb choice for a holiday whether you want to simply relax or get out and about exploring. Less than one mile from the coastal footpath. Village location with tea rooms, farm shop, general store and art gallery. High Speed wi-fi 40” smart TV Children welcome from age 12.